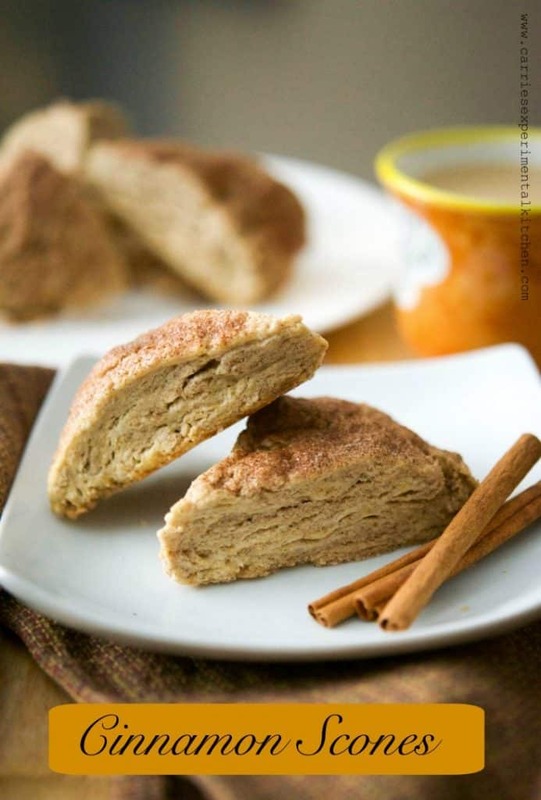 Cinnamon Scones are deliciously moist and perfect for a quick on the run breakfast or afternoon snack with a cup of your favorite hot beverage. I guess I’m on a scone kick lately because ever since I made these with pumpkin and cranberries, I’ve been dying to make another kind. 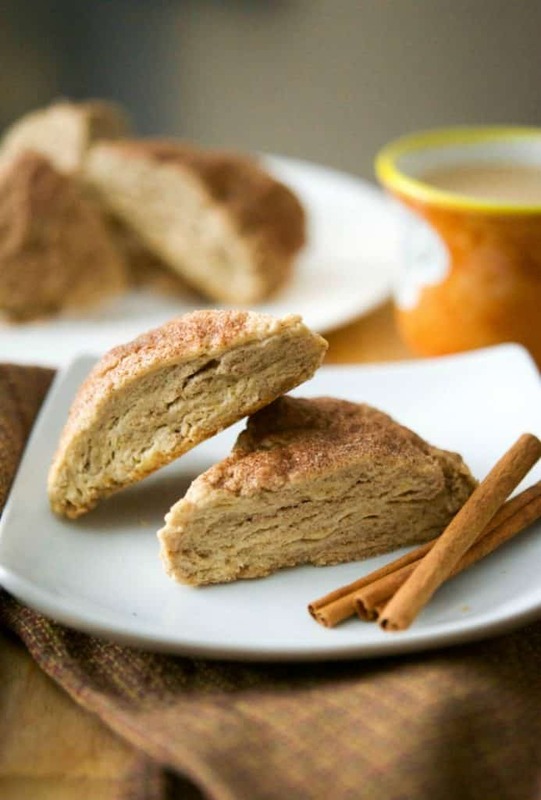 My all time favorite are cinnamon chip scones from Panera Bread, but I can’t locate cinnamon chips in my local grocery store so I just made my own version without the chips. I have to say they were not lacking in the cinnamon department and were quite tasty. In fact, these were so good and incredibly moist for a scone. I mean just look at the flaky layers in there. Scones are so easy to make too. For this recipe I combined flour, brown sugar, baking powder, and ground cinnamon; then worked in some cold butter until it resembled coarse meal. Next form a well and add an egg and heavy cream. Mix well; then shape the dough into an 8-inch round circle approximately 1-inch thick. Brush the top with a little heavy cream; then sprinkle a mixture of granulated sugar and cinnamon on top. Cut the circle into 8 wedges and place on a parchment lined baking sheet. Bake at 350° F for 14-16 minutes until the bottoms turn a light golden brown; then remove from the oven to cool slightly before completely cooling on a wire rack. 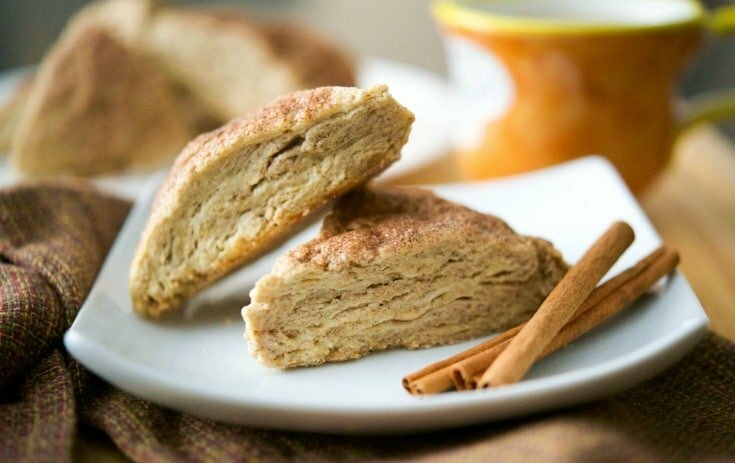 This recipe makes eight Cinnamon Scones so if you’re not going to eat them within 1-2 days; I’d recommend freezing them. Wrap them individually with plastic wrap; then place in a storage container or resealable plastic bag and allow them to defrost for 1/2 hour before eating. 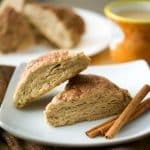 My family really LOVED these scones and not only are they tasty for breakfast, they make a great afternoon snack with a cup of hot tea or coffee. If you can find cinnamon chips, go ahead and add in about 1/2 cup to give them a little extra cinnamon flavor, I bet you’ll love these even more. ~Enjoy! In a large bowl, combine the flour, brown sugar, baking powder, 2 teaspoons of the ground cinnamon; then using a pastry blender, cut in the butter until the dough looks like coarse meal. Form a well with the dough; then add the egg and heavy cream. Mix with a wooden spoon until the wet ingredients are incorporated with the dry ingredients. Turn onto a lightly floured surface and shape the dough into an 8-inch round circle approximately 1-inch thick; then place on a parchment lined baking sheet. In a small bowl, combine the remaining 1 teaspoon of ground cinnamon with the granulated sugar. Brush the top of the dough with some heavy cream; then sprinkle the top with the cinnamon sugar mixture. Cut the dough into 8 wedges; then bake for 14-16 minutes until the bottom is light brown. Remove from oven and allow to cool for a few minutes before transferring to a wire rack to cool completely. What are your favorite type of scones?